Mom Was Right. 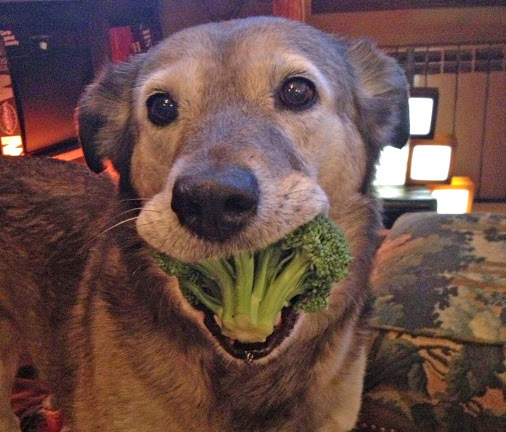 Broccoli Is Good For You And For Your Pet…Or Is It? We’re at the health food store several times a week. Most of the time it’s to pick up ingredients for our dogs homemade meals. We usually have very little interaction with the staff, but one day a cashier politely exclaimed, “Wow, you guys must sure love broccoli!” Now don’t get us wrong we aren’t buying broccoli by the truck loads, but we are adding in generous amounts to their food. My husband was waiting for my response and instead of explaining why I’m some kind of veggie monster, I just said, “Yup the kids love it!” Which in fact they sure do. Although, Angelo took some time getting used to it. Broccoli is a cruciferous vegetable. Along with cauliflower, kale, bok choy and Brussels sprouts these veggies all contain vitamins and minerals that are important to your health. Cruciferous vegetables are rich in sulfur containing compounds called glucosinolates and indole-3-carbinol. Now what are those things anyway? Glucosinolate is a natural compound found within broccoli (and other members of the cruciferous family) which helps support detoxification and protect against diseases. Indole-3-carbinol is produced by the breakdown of glucosinolate and has shown to aid in protection against tumor growth. Sulforaphane is another compound found within broccoli and a recent study suggests that this particular compound may not only prevent cancer, but also be able to fight it as well. As mentioned earlier researchers have found that sulforaphane is quite beneficial and may help us aid in the fight against cancer. But there are those who argue that sulforaphane is harmful because it can kill bacteria, insects, worms and poison mitochondria. Mitochondria is known as the “powerhouse” of our cells and supplies energy to them. Some researchers support the theory that mitochondrial dysfunction is one of the reasons that we age (both humans and animals). Before anyone starts going off on a tangent, you must consider the fact that drinking too much water can be fatal or that eating too much potatoes can cause solanine poisoning. Bottom line, anything in excess can potentially be harmful. What may be causing confusion is the dichotomy of broccoli. That it is beneficial but yet potentially poisonous at the same time. Enter what scientists call hormesis. Hormesis is a theory that says small amounts of toxic agents (which in normally large doses could be fatal) can actually be beneficial and improve our health. Thus helping us live longer. Basically, the body adapts and comes out stronger. There are several studies that have been done which support this theory, even one has been done with dogs and toothpaste (though we don’t suggest you start giving your dog large quantities of human toothpaste). Let’s go back a bit. In the 1950’s scientists began researching chemical compounds of certain vegetables, like broccoli (and other members of the cruciferous family) to see what role they played in the health of the thyroid gland. They coined the term, “goitrogen” which is used to describe any chemical, drug or food substance that can cause the enlargement of the thyroid gland. It does this by blocking the thyroid gland from taking in any iodine. Before you start picketing outside of your local grocery store and demanding that they remove all broccoli from their produce isle, keep in mind that researchers have concluded that there really is no such thing as a “negative” substance in food. Rather there are some nutrients that are very helpful to individuals and other nutrients that are not a good match because of ones health history. So is broccoli and it’s other vegetable brother and sisters the cause of hyperthyroidism? Hardly. The vast majority will find that if they cut out goitrogen foods, their condition will remain the same. It’s estimated that in canine’s 90% of cases of hyperthyroidism is causes by autoimmune thyroiditis. A very sad statistic, but one that gives credence to the fact that broccol is not causing it. Beyond anecdotal accounts, we were unable to find any concrete studies which attributed cruciferous foods to causing hyperthyroidism in dogs. The benefits of the vitamins and anti-oxidants contained within broccoli far outweigh any negative’s, as one would need to eat an extraordinary amount in order to suffer any ill effects. Now if you are over-protective pet parents (like we are) it’s best to lightly cook the broccoli before serving it to your pup’s. Stir-frying (with coconut oil) or steaming (for 20 min) is shown to inactivate goitrogens, but still retain it’s anti-cancer properties. Is there a magic formula on how much broccoli your fur baby should eat? Not necessarily, as with anything it’s dependent upon the size and breed of your dog. However, as instructed by our veterinary professional, for every 20lbs one would give 1/4 cup of cooked broccoli per feeding. Besides it’s anti-cancer fighting abilities, we love broccoli for a variety of reasons. Cholesterol Reduction- Due to it’s soluble fiber it’s able to reduce cholesterol in the bloodstream by helping the liver produce bile, which carries out the extra cholesterol through the digestive tract. Cardiovascular Health– This is one of our favorite benefits. Sulforaphane (yup you know what this is) helps to activate a naturally protective protein called Nrf2. Nrf2 is not active in these areas of the heart, and thus sulforaphane helps to activate it, thus curbing the inflammation and build-up in the arteries. Eyes- There are high concentrations of lutein and zeaxanthin in broccoli. Which are chemicals that protect against degenerative conditions that impair eyesight. Anti-Inflammatory– This is especially beneficial for senior pets or those that are prone to back issues (dachshunds). Compounds in broccoli help to block enzymes that cause joint destruction, but putting a stop to a molecule that is known to cause inflammation. Also dont’ forget about vitamin K, which helps to keep calcium deposits in the bones, thus making them denser. Do you know of any other health benefits of broccoli? Or have any other foods that you would like to recommend? Comment below and don’t forget to share this article!